A few weeks ago, I learned that somebody had been pretending to be friendly with me for quite a long time. This person was uninterested in explicating feelings or having any rational point of reference. What mattered most to this person was hostility. As you will soon see, the email was ridiculously petty and obstinately worded. Therefore, my audio series — Hate Mail Dramatic Reading Project — must continue. The following clip represents my dramatic reading of the hate mail in question, read in the style of a Miss Manners schoolmarmish tone. During the course of my reading, not only did the email feel like a pointless lecture, but I began to wag my fingers midway through the delivery. I have spent most of the afternoon keeping my hands in a folded position to prevent such gestural mishaps from occurring. And should you find yourself uncontrollably pointing while you are listening to the file, I apologize in advance for any finger-related inconvenience. Click any of the below links to listen. #4: A hate mail read in the style of a drunken Irishman. ya know, these posts remind me of Lenny Bruce when he would read court transcripts during his stand-up act. You don’t sound at all like my idea of Miss Manners – but the email was obnoxious, in a ridiculous way (or vice versa) and deserved the send-up. Yeah, Miss Manners is more the quiet psychopath type. One thing I notice about these hate mails is they start out seeming reasonable — the writer begins with a measured tone. But as they go on and on, the opinions expressed get whackier, and the pent-up anger bursts forth, and the opinions become unreasonable. 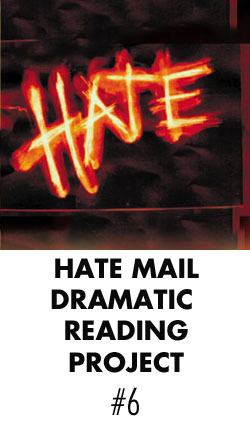 I’d like to send you hate mail for future dramatic reading, but I’ve nothing to rant passionately about.